Early Wah's were made in California, but Joe Benaron, president of Thomas Organ, wanted to move production to Italy to reduce costs. 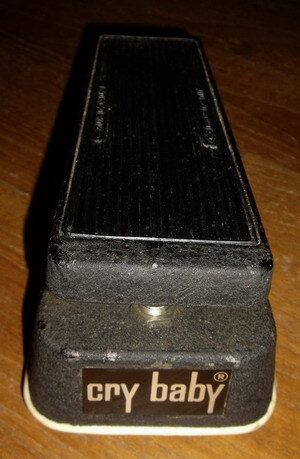 Joe approached the manufacturing company Eko in Italy about making the Wah. Eko declined, but Eko's manufacturing manager, Ennio Uncini, wanted to do it. Ennio and Joe then formed their own company in 1967 called JEN (named from the J in Joe and EN from Ennio). 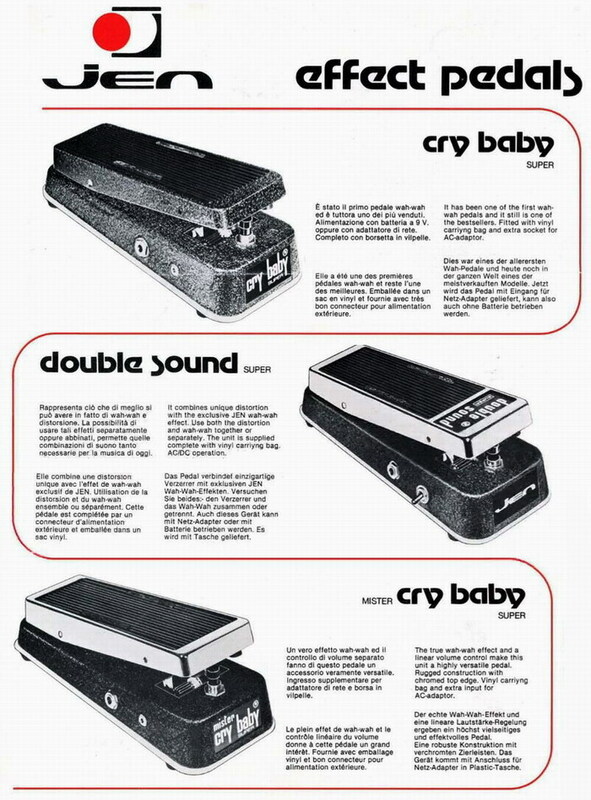 Ennio supervised operations in Italy, where Jen handled the Cry Baby Wah production for a while in 1968, as well as making the Vox Wah Wah's and other Vox pedals like the Vox ToneBender. Thomas Organ distributed the pedals in the USA, and Jennings Electronics Industries (run by Tom Jennings, owner of the Jennings Organ Company and former head of Jennings Musical Industries) distributed them for the European markets. Jen then began to market a line of pedals under their own brand in 1968. Many were sold in the US under Gretsch and Sam Ash brands. Thomas Organ patented the Wah circuit design, but by the time the patent was granted there were already dozens of copies of the pedal on the market. It was decided enforcing the patent was too expensive, so no attempt was made to stop the knockoffs. Jen then got into the market of cloning other company's pedals themselves. Around 1973 Jen created a series of four brightly colored effect pedals in die cast enclosures, each with slider controls rather than knobs, and each using reworked circuits based on existing designs from other companies. One of these was the Jumbo Fuzz, which was also rebranded as the Dallas Arbiter Jumbo Fuzz in Europe, and the Sam Ash Jumbo Fuzz/Sam Ash Fuzzola II in the America. The enclosure used was simiar to Jen's black powder coated ToneBender case, but with recessed areas on the top for the color label plates to be applied. 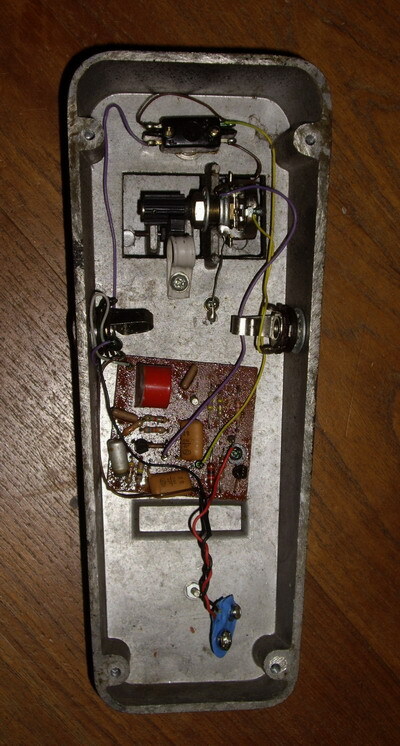 The same enclosure was also used by Jen for some Vox ToneBender production and the Unicord Fuzz. 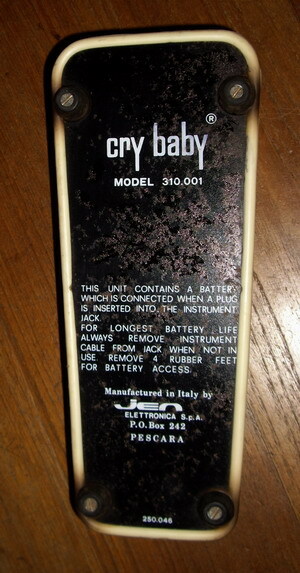 A key identifying and dating feature to the enclosure was the white rubber skirt edging used around the bottom cover, which was identical to the edging used on 1973 production of the the Dallas Arbiter Wah Baby, the Jen/Vox Cry Baby Wah, and the Jen/Vox Double Sound distortion wah pedal.